BEHIND its high walls, the courtyard of the nunnery of el-Mohareb in the scruffy desert near the Valley of the Kings is empty but for old pews, barrels and discarded junk. The nuns are hiding from an unkind sun in their beehive-domed cells. They are praying for mankind among the snakes and the scorpions. Only the flies are lively. Then Sister Sabla arrives from around the corner in a grubby habit, still chewing her lunch, to let us into the 11th-century church. "There are no flies inside," she says. "They know it is a holy place." And indeed there are not. Egypt appears to have observant flies. The Copts are the Christians of the Nile, about 10 per cent of Egypt's estimated population of 80 million. Their history dates back to the very beginnings of Christianity, emerging from under the last of the pharaohs in a tangle of paganism and the new faith brought to Alexandria by the apostle Mark. It is usually Egypt's pyramids that attract attention, but this ancient Christian culture boasts a legacy of historic churches and fortress monasteries in cities and deserts, of historic churches and rich icons, that has few equals. The historic churches, still used in the four-hour liturgy, derives from that used in Cleopatra's day. 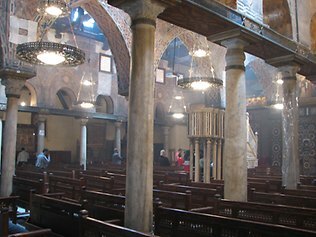 There have been times of terrible strife down the years but multicultural Egypt's Christians, Jews and Muslims have also rubbed along for centuries, as side-by-side churches, mosques and synagogues in Cairo testify. Islamic extremism and the deposed Mubarak regime's divide-and-rule tactics have, though, taken their toll in recent decades, with more than one Coptic church attacked and burned. How long the Copts have been here can be gauged by visiting the Hanging Church in Old Cairo. The capital's Coptic enclave pre-dates the Islamic city. The church, just opposite the St George metro station, is suspended 10m above the old street level on top of a Roman fort. This giddy construction is visible through slots in the floor of the church. Enter via a courtyard lined with images of Coptic popes (Yousab II sports natty Elton John-style sunnies) and enter a nave heavy with incense where Coptic families, and some Muslim women, come to pray in front of the saints' icons and relics. One of the 15 marble columns (Jesus, apostles and disciples) of the medieval pulpit is black, to mark Judas's betrayal. Lebanese-cedar screens inlaid with patterns of Sudanese ebony and ivory Coptic crosses separate the sanctuaries. Nearby, through a 12th-century iron-studded gate, is a sunken walled lane leading to more of the 14 churches that huddle together in the area. Glimpsed through another gate is the Convent of St George; if visitors are lucky the nuns will agree to open their chapel, with its chains that were used to bind the saint at his martyrdom. Coptic tradition emphasises the Holy Family's flight from Herod into Egypt. At least 42 religious sites mark their stay. Around the corner is the 5th-century Church of St Sergius, with its Islamic-influenced decoration and columns recycled from a Roman temple. The crypt underneath is believed to be among the places where the family once sheltered. Next door is the Ben Ezra Synagogue, a former church bought by the Jewish community from the Copts and restored in the 12th century, and traditionally considered the site where Moses was found in the bulrushes. Religious art can be seen in the refurbished Coptic Museum behind the Hanging Church. It is here that the emergence of Christianity from paganism is lucidly illustrated. Early Coptic sculptures, fine textiles and paintings are full of references to the old gods -- Aphrodite emerging from her shell, a drunken Dionysus clutching a glass of wine -- while an image of Mary breastfeeding Jesus is derived from depictions of Isis suckling Horus. The airy museum has expanses of this fascinating syncretism that makes you ponder the common roots of many of the world's religions. Even the Coptic cross may be derived from the ancient Egyptian ankh. Copts date their calendar from the Era of the Martyrs, when thousands of Christians were murdered by the Romans, and it wasn't until Constantine liberated them and closed the pagan temples in 313 that Coptic sacred art fully flowered. The iconography is instantly recognisable by its wide-eyed figures with dark circles around each orb. The church broke away from Eastern Orthodoxy after some heavy-duty nitpicking over the divine or human nature of Jesus, and it was Egypt's religion until the Arab conquest ushered in Islam. The Copts have survived, their fortunes waning, waxing and waning again until, in the late 20th century, a spirit of renewal prevailed. One of the strangest manifestations, if you are willing to take a particularly smelly journey, is found in the Muqattam Hills on the edge of central Cairo. Though the Copts may be best known for their presence in the professional classes, they are the Egyptian capital's rubbish collectors and live in Garbage City, an indescribably filthy slum where the city's refuse is recycled. Whole families are at work, separating wiring, paper and bottles into huge piles. In the cliffs above is the Monastery of St Simon the Tanner, a complex of massive cave churches, the largest of which holds thousands of worshippers. To appreciate the full panoply of Coptic life, however, you have to head out to the deserts. Fortress monasteries across Egypt were the model for Christian monastic life worldwide. The monks no longer talk to lions or survive only on dates and morning dew like the hermits of old, but they still wear the black robes, with Coptic crosses embroidered on the hood and tattooed on their hands. The easiest to reach are just off the highway to Alexandria, clustered together at Wadi Natrun oasis. Behind high walls peep chapels and forts where in centuries past the unarmed orders could pull up the drawbridge to withstand long sieges by fearsome Berber marauders from the west. Each is fascinating but the Syrian Monastery has the best art. Dutch restorers are still uncovering the most exquisite 7th-century wall paintings. There is also a tiny rock chapel with a hook in the ceiling to which a monk would attach his pigtail to prevent himself from nodding off during devotions. The flies are more agnostic here, buzzing in and out of the churches without so much as genuflecting. Nearby at St Bishoi Monastery, a wisecracking priest leads a lightning tour of its treasures, practically high-fiving pilgrims who step forward to kiss his hand. At St Macarius, meanwhile, are techno-monks, experts in agriculture and engineering who make the desert bloom. All this while fasting for almost six months each year (on and off) and guarding the head of John the Baptist. The further you reach into the wildernesses of middle Egypt, where monasteries are hidden in valleys or perched on cliffs, the more the sense of ancient isolation enfolds you. You can visit the most splendid of these but somehow Sister Sabla, selling el-Mohareb honey from her decrepit nunnery, feels more humbly real. Although the church was founded in the 4th century by empress Helena, there are no towers, famous body parts or icons to attract tourist buses -- just plastic chairs, ancient arches and silence. You need only follow a line of electricity pylons down a dirt track off the road to Tutankhamen's tomb to find her.